The use and replication of the main output of METGROW+, i.e. the METGROW+ toolbox, boosts the European mineral extractive and processing industry since it triggers the cost-effective exploitation of Europe’s domestic low-grade primary and secondary resources. The toolbox provides a feasible, sustainable, cost-effective set of processes, ranging from upstream activities to downstream activities. Hence, vast levels of previously untapped resources are unlocked. Cover a wide range of mineral compositions. As an example of the unlocked potential, more than 70% of world land-based Ni resources are contained in laterites, but only 40% of Ni is produced using Ni laterites as a raw material because of the high operation and investment costs of conventional processes. Moreover, significant amounts of Co and often Sc are associated with these deposits, but they are currently not recovered due to technological constrictions. In Europe, known laterite deposits exist, especially in the Balkan Region and Poland. Thus, from the use of METGROW+ toolbox, these sources can be further exploited, estimating that these regions have the potential to supply 30% of the Co requirements in the EU based on conservative estimates. Aside from sources selected herein, the METGROW+ toolbox has been conceived so as to be able to provide a processing solution for other low-grade sources. These include freshly produced and landfilled streams of other metallurgical slags, complex polymetallic ores, incineration ashes or dusts, several types of tailings etc., i.e. covering a wide range of materials whose potential is not being currently used yet by Europe. 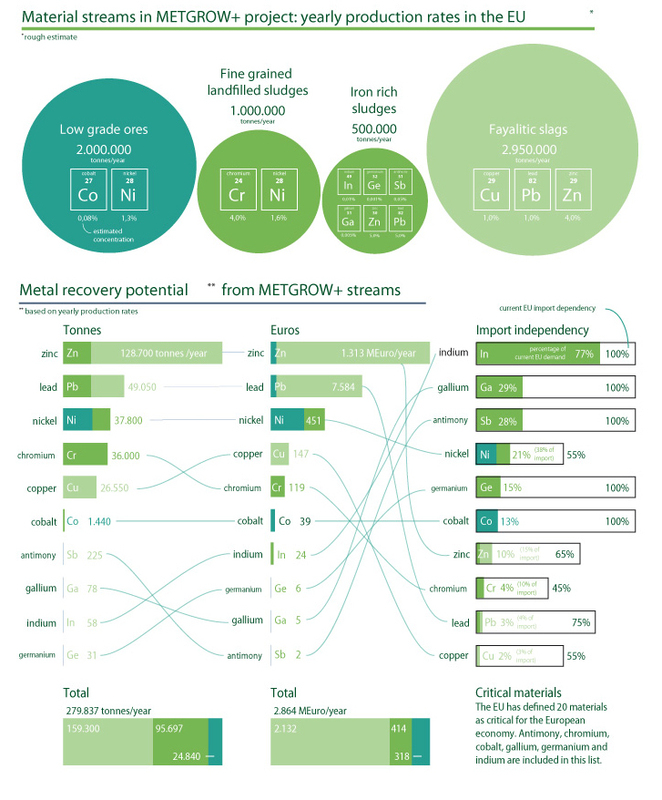 In addition to the direct impact in metal exploitation and production rates, the use of the METGROW+ toolbox has a cross-sectorial impact in the metal-related European industry, since it produces a set of process steps that cover the value chain. Hence, other stakeholders will benefit from the wide deployment of the toolbox. Moreover, METGROW+ is aimed to make a contribution to European raw material sector at a transversal level. Since the toolbox addresses technological, environmental, economic and social assessment, different levels of the European scenario can benefit from the information provided by the tool: public bodies can retrieve information for policy making and about social impact (policy level), companies can be aware of best approaches for sources exploitation (market/business model level), whereas the community can learn about new trends and technology performance (technological level).